Detention Bench with Handcuff Bar - 84"
This stainless steel detention bench is 84 inches long and 12 inches wide with a full-length handcuff bar. It is an integral unit and fully welded. It is fabricated from 12 gauge type 304 series stainless steel with a brushed satin finish. The corners are rounded and ground smooth. There is a 1.5 inch return all around the bench. The floor flange is 1.25 inch type 304 series stainless steel and is welded to 2 inch schedule 40 type 304 series stainless steel. 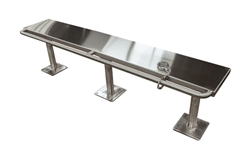 The handcuff bar is 1.25 inch diameter type 304 series stainless steel and is welded to the bench. Fasteners are not included. PLEASE NOTE: The detention benches are fabricated to order. Please call (610-867-1401) or email us for estimated ship dates.